On your wedding day, you deserve nothing less than absolute perfection. 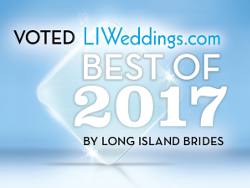 At Jericho Terrace, our variety of gorgeous ballrooms, selection of premier Long Island vendors, and award-winning cuisine are suited to make each one of your most detailed dreams come true. As a testament to our promise of perfection, we offer you a complimentary event planner to ensure that your event is seamless in every way possible. Our glistening ballrooms embody an atmosphere of absolute perfection. Complete with handcrafted décor, kinetic lighting, and panoramic glass ceilings, you and your guests will dance the night away in our grand ballrooms. Our selection of spacious cocktail rooms are perfectly suited for a sophisticated affair. Mix and mingle with your guests beneath hanging gardens while you enjoy your cocktail hour. With a variety of textures, features, and sleek, contemporary décor, the photo opportunities at Jericho Terrace are infinite. Be sure to make some memories with friends and family both indoor and outdoor! As you’re seated for your reception dinner, be wowed by the variety of delicious cuisine that Jericho Terrace has to offer. As you and your guests are served by our professional, white-gloved staff, you can be sure that each moment will be savored, even after the last bite. Through our Elegant Affair Program, you will be provided with endless creative ideas and professional recommendations that always keep your budget and taste in mind to create the affair you'll remember forever. From invitations, to transportation, to floral arrangements and everything in-between, trust the selection of Jericho Terrace's established vendors.